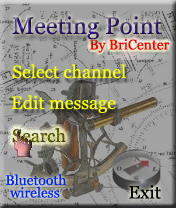 MeetingPoint is a free, simple, short-range contacting software, using Bluetooth wireless technology. Bluetooth can "see" through walls, doors and people, at all directions at the same time. Its effective range is usually 30ft (10m). MeetingPoint follows the CB-style paradigm of channels, where people on the same channel are able to send messages to each other. It works on supported Smartphones, PDA (Personal Digital Assistants), and also on Windows PC/laptops. Arranging a meeting with someone you don''t know in person (e.g. 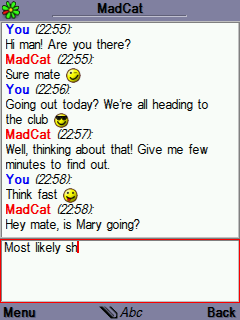 virtual friends from a chat room). Just tune your MeetingPoint to a previously agreed channel, and go to the meeting point (airport, crowded pub, etc). When you are within range, both MeetingPoints will fire audible alarms, making you aware of the other party's location. Contacting like-minded people, or pals sharing your interests, religion or preferences. For example, if you are a huge fan of the Red Hot Chili Peppers, you might want to search for others using "REDHOT" as your channel. Mass-sending a message to everybody within range, not just MeetingPoint users. Other Java Freeware of Developer Bricenter S.A.